Reaching the third trimester is a significant milestone in your pregnancy. Now that all the main fetal systems are in place, all that is needed is time for them to mature. In the early weeks of this trimester the placenta continues to grow, though not as fast as the baby. These last few weeks can be physically demanding: your lungs and other internal organs are becoming more compressed as the baby increases in size; your blood pressure is slightly more raised and any back pain you have been suffering from may increase in intensity. While your increasing size can give you discomfort, you can nevertheless start to look forward to your exciting new arrival. The brain is growing fast and, in order for it to fit inside the skull, the brain tissue now folds over itself so that, in cross section, it resembles a walnut. The fatty, protective myelin sheath that covers the nerves in the spinal cord now coats the brain’s nerve fibres, which leads to faster nerve impulses from the brain to the rest of the body.This results in fetal movements and reaction times that are much quicker and more sophisticated. Not only is there still sufficient space in the uterus for the fetus to move more (after about Week 30, your baby’s movements will gradually diminish as space becomes tighter), but its strong kicks, somersaults and changes of position are felt most strongly in this period. This is because less amniotic fluid is being produced than before, so its cushioning effect is reduced. It is common for women to have vivid dreams throughout their pregnancy, especially during the last trimester. No one really knows why this is so, but it is thought that dreams are a way to subconsciously deal with your fears and concerns about impending birth and motherhood (see Chapter 9, p. 264–6). The birth is still some way off, but you can keep your partner involved in your pregnancy by talking about your antenatal appointments when you have had one. Most partners will want to be present at the birth, but this is not always the case. It is a good idea to have someone to accompany you during labour – they are known as your ‘birthpartner’.If this is going to be someone other than the person you are in a relationship with, you could start thinking about who this might be, so that they can prepare themselves and attend antenatal classes with you, if necessary. See Chapter 5, p.134 for more information on choosing a birth partner. 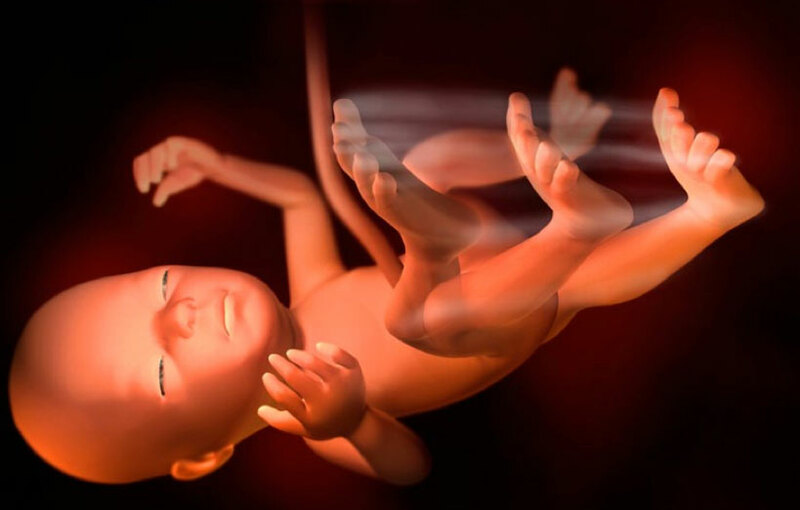 Skin creases are visible on the hands and the eyes are fully open, blinking and are sufficiently sensitive to light that the fetus will turn away if a strong light is shined at your abdomen. The fetal lungs are maturing fast and lanugo and head hair are well developed. The amount of white fat increases to 3.5 per cent of body weight and smoothes out the wrinkles ontheskin.Toenails are visible,lagging behind the fingernail development by four weeks. The CRL is 25 cm and the weight is about 1,000 g.
The bottom of the rib cage has started to arch out a little in order to create more space for the increasing size of the uterus. This can cause pain in the lower ribs, especially if you are of relatively small build. Heart palpitations (cardiac arrhythmia) can also arise at some point in the third trimester, which can feel very unpleasant, although they are not usually a sign of anything serious (see p.127). If a blood test taken at the start of your pregnancy has shown that you are Rhesus D positive, you will be given an ‘anti-D’ injection, either now or at any time up to 34 weeks.